A few days ago, I saw a picture of the breakfast station on facebook and it reminded me of the Cotton Candy machine I always wanted to have. And that's where you come in... Could you please get me these beautiful things from Nostalgia Electrics? But not yet... I do not have much storage room in the kitchen. So, could you please, pretty please, get me these as soon as you find out that I'm living in a place with a bigger kitchen? I would really appreciate number 3, to keep next to the tv. But it has to be the one in the picture, with the super cute candy section. Thanks!!! Next is the order of priority, you can check the image above for color and design references. Omg yes! I want the popcorn machine and the cotton candy maker! Cool want that popcorn machine. Happy Holidays to you and yours. Yes, where can I sign up to ensure I get a hotdog grill on Christmas day?! The popcorn cart is fantastic!!!!!! kisses darling and happy sunday! I want cotton candy maker!! It's one of my dreams since i was child . 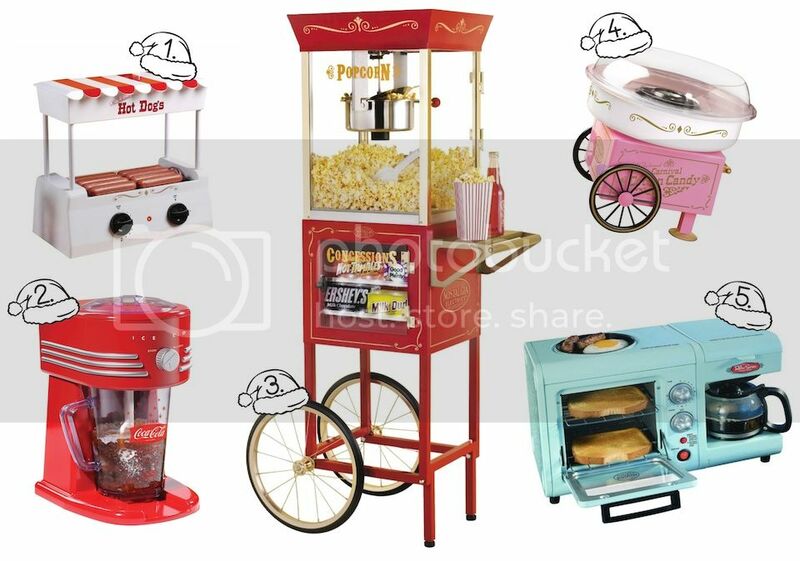 i want the popcorn maker <3 sooo cute! Want the cotton candy maker! I love the popcorn stand, definitely my favourite. I totally need that cotton candy machine! It is just the cutest! My parents have that popcorn machine and I love it! These look adorable, love the hot dog grill! I want the cotton candy maker, so cute! Wishing you and your loved ones a very Merry Christmas and Happy Holidays! May it filled with joy, love, peace and happiness!